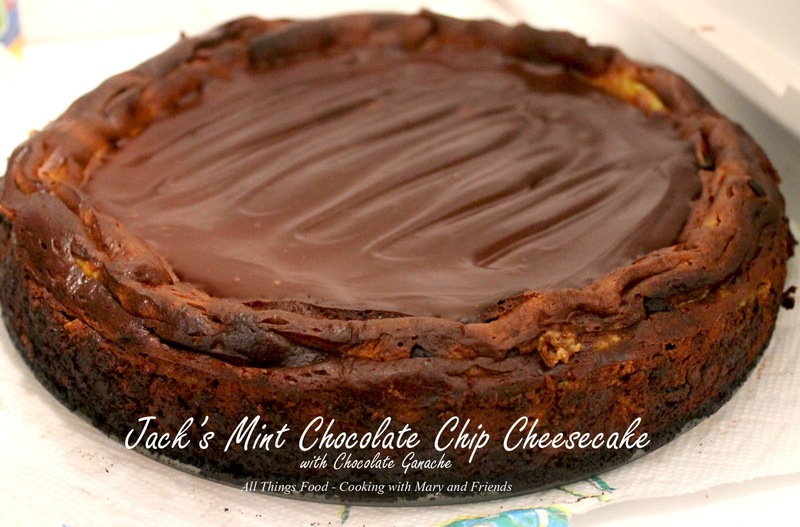 Jack is a long-time friend who has a specialty of creating/baking a variety of cheesecakes in just about every flavor imaginable. 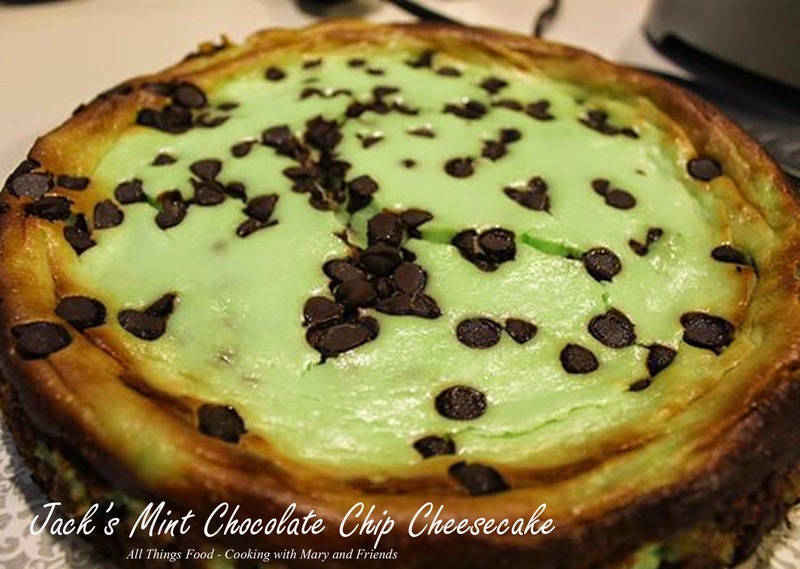 My personal favorite of his is this Mint Chocolate Chip Cheesecake. He recently made not one, but two for me ... one for my retirement pot luck and one to take home. Oh my goodness, it is so good. I shared some with my grandsons, and my oldest grandson, Ethan, declared right there and then he had to have this cheesecake for his birthday! Well, I reached out to Jack to see if he could make me one, but he was going to be out of town, so he gave me his recipe! Whoo Hoo!!!! So in honor of Jack, here is his recipe. Preheat oven to 375. In a large bowl, combine chocolate cookie crumbs and melted butter. Press onto the bottom and 2 inches up the sides of a 9-inch spring-form pan. In a large mixing bowl, beat cream cheese and sugar until combined. Beat in creme de menthe chips. Pour into crust-lined pan. Place spring-from pan in a shallow baking pan and bake 50-55 minutes or until center appears nearly set (mine took approx. 60 minutes). Remove from oven and cool on wire rack 15 minutes. Loosen crust; cool for 30 minutes. Remove side of pan; cool cheesecake. Cover and chill 4-24 hours. Before serving, in a small saucepan heat cream until just hot over medium heat (do not boil). Add chocolate pieces and stir until melted. Remove from heat and allow to cool slightly; beat briskly every few minutes. Ganache will thicken as it cools. Once ganache has cooled some and thickened slightly, pour over cooled cheesecake.